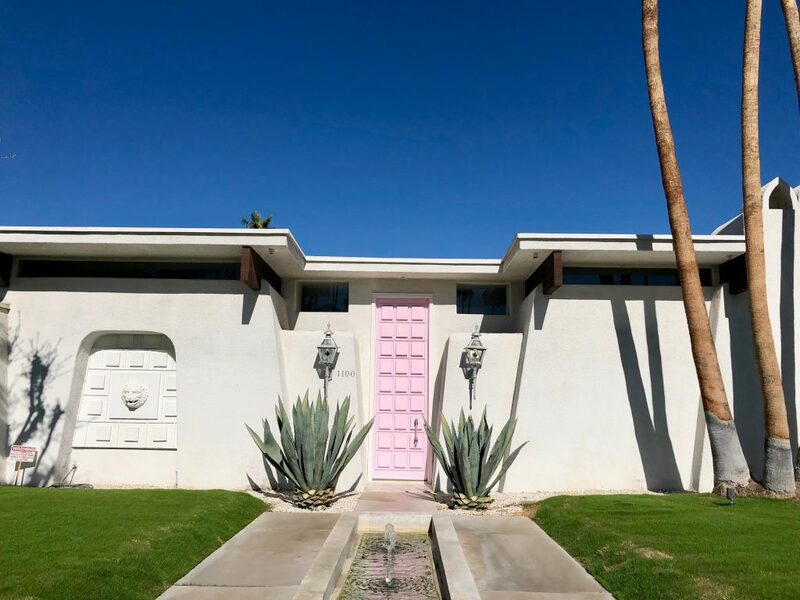 Have you heard about the popular Palm Springs Door Tour that’s been available on and off in Palm Springs, particularly during Modernism Week. It takes travelers by bike or on foot past some of the coolest doors in the city. It can be pricey, and that’s IF you can get a ticket to it. You can take our version of this tour all on your own with our handy e-book and map guide. Go at your own pace; take a van full of pals or borrow a bike and join some friends. This is the ultimate door tour because you can customize it for yourself, and the time you have available. descriptions of each fabulous door and a bit about the home and its architecture. photos are included so you can see which ones are most interesting, and choose the ones you want to see if you have limited time. This material was sourced over many hours of driving around Palm Springs streets and looking for interesting properties, as well as poring over Google Maps for exact address info. We trust you’ll find the nominal price for all this hard work a steal! While all the info is complete and accurate, this DIY tour is still a work in progress so if you happen upon a great new door that you think should be included, take note of the address and share some photos if you wish. We’ll look at adding more doors and grouping by neighborhoods in further editions. 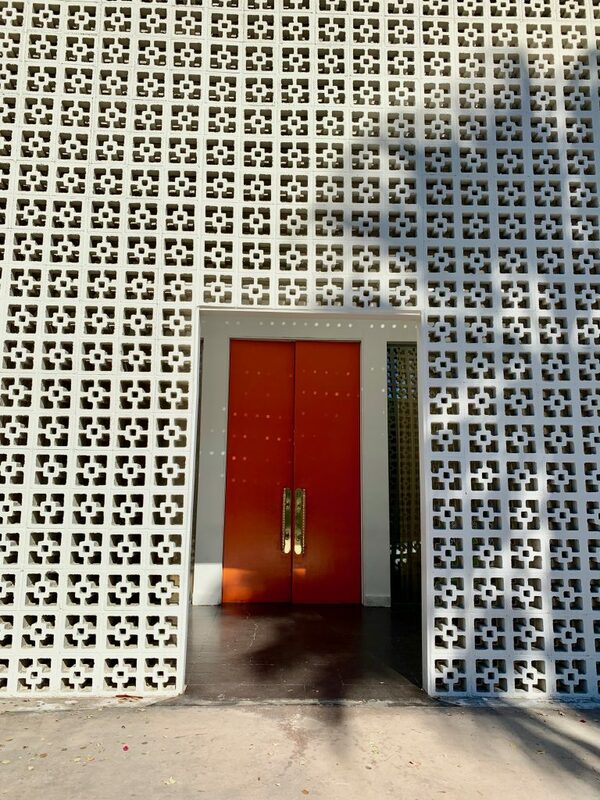 Download the Palm Springs Architecture Door Tour e-book HERE! You’ll receive the digital PDF file shortly after completing your transaction. To give you a taste of what you’ll see on the tour, take a look at a couple of the amazing doors you can find in the e-book. There’s more than 30 other doors inside the e-book for you to explore! Arguably one of the most photographed and iconic doors in Palm Springs, this door is double tall with 27 perfect squares carved into it. The bright baby pink shade pops against the white stucco of the Spanish-style home. The iconic entrance to the Parker hotel has been seen in photographs the world over. The soaring wall of breeze block is backed by a massive pair of orangey-red doors often manned by handsome gentlemen in white shirts and pink pants or jackets. One of the more architecturally interesting fronts, this property has a sky blue glass double door that’s nice, but it’s the sculptural panel of 12 circles to the right of the door in the exact same hue that makes this entry a standout. With clear views from the curb, this is a great selfie stop. Download the Palm Springs Door Tour today! 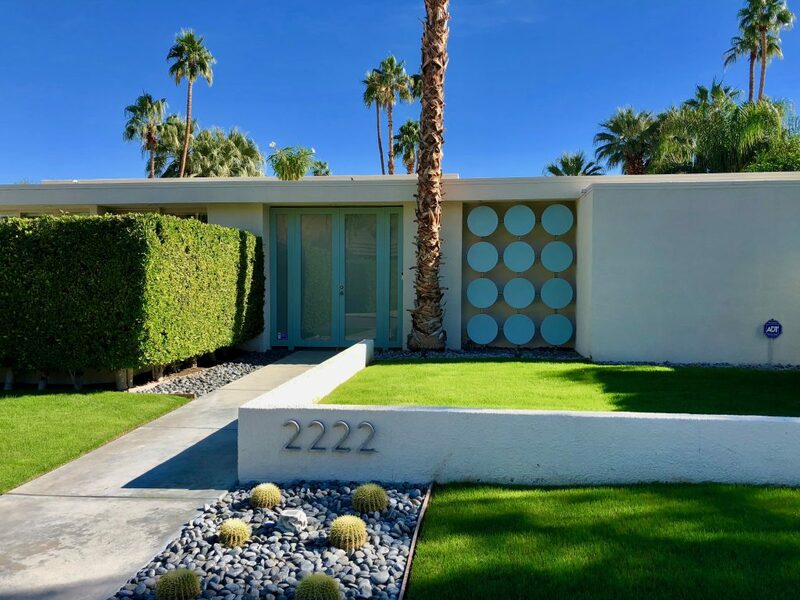 By downloading the Palm Springs Door Tour e-book you’ll get a list of many more of the coolest homes and the great thing is they’re all relatively close together, making it easy to see a handful—or the whole list.